Many analytical instruments characterize a sample by outputting a spectrum, which represents, in the form of a plot or data table, how some observed signal from a detector varies continuously as a function of another parameter. Many types of spectra exist. A mass spectrum, which is obtained in a mass spectrometer analysis and is therefore of interest to many SIMION users, is a plot or histogram of the signal intensity v.s. mass-to-charge ratio (m/z) for an ion population. An energy spectrum, which may be obtained in electron spectroscopy with an Hemispherical Deflection Analyzer (HDA), is a plot of intensity v.s. particle energy (rather than mass). An ion mobility spectrum, which is obtained in ion mobility spectrometry, is a plot of intensity v.s. drift time through a medium (related to particle size and shape). A frequency spectrum, such as obtained in ion cyctrotron resonance (ICR) mass spectrometry or in an orbitrap, is a plot of intensity v.s. frequency of a current signal, which might in turn infer a mass spectrum. Other types of spectra exist, such as absorption and emission spectra representing things like intensity of v.s. wavelength for light, but these don’t necessarily involve charged particles and therefore are of lesser interest in the context of SIMION. For a mass spectrum, the two axes are interpreted as follows. The intensity in the signal depends on the type of detector used but is typically a current or particle count, which for quantitative purposes if ideally (but not necessarily) roughly proportional to the number of particles hitting the detector (at least within the “linear dynamic range” of the detector). The m/z ratio conventionally assumes masses in Daltons (u) and charge in elementary charge units (u). The m/z ratio actually is not measured directly but rather inferred from the instrument, which may record position (using detector arrays), time (e.g. SIMION Example: TOF), electrode scanning voltage (e.g. Ion Trap), or an induced current frequency signal (e.g. ICR). For some types of mass spec sources, it’s usually the case that z = 1 (e.g. single charged cations typical in EI sources), but in other cases, different peaks may often correspond to different z values (e.g. typical in ESI sources), so it’s really a mass-to-charge spectrum not a mass spectrum. Scanning: Depending on the type of mass analyzer being simulated, you may need to scan electrode voltage and acquire ion trajectories over the scan. See SIMION Example: tune, SIMION Example: spectrum, and SIMION Example: hda for examples and notes on voltage scanning from a user program. Other mass analyzers like SIMION Example: tof do not require a voltage scan. Particle starting conditions: You will need to appropriately define the starting conditions of your particles traced–in terms of time, space, and energy– to be statistically representative of the much larger population of actual particles that would physically exist in your system. A spread in particles at the source will result in additional spread at the detector and hence peak broadening. As a Monte Carlo Method simulation, a large number of particles may be necessary to obtain smooth peak shapes. You may compare results with different numbers of particles. Acquisition point: You will need to acquire data at the detector. Data can be acquired upon particles splatting on a (detector) electrode, upon passing an orthogonal plane (via Data Recording, When=Crossing Plane), or from a user program upon passing arbitrary planes (see SIMION Example: test_plane). Output, processing, and plotting: You could acquire particle splat data and Exporting “data recording” results to text file using Data Recording and then use some external program (e.g. Excel or Matlab) to analyze or plot the data. Alternately, you can do the analysis and plotting entirely from a SIMION user program, like in SIMION Example: spectrum. 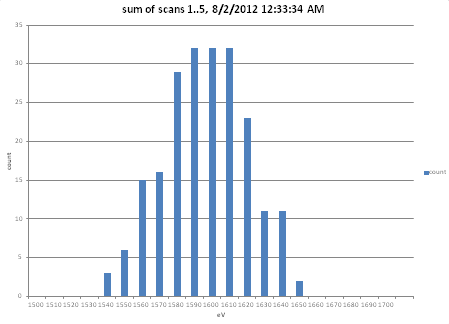 Both cases typically will involve some type of “binning” to generate a histogram from particle counts. If generating the spectrum via user programming, simionx.Statistics make_histogram() can help (as shown in SIMION Example: spectrum). In the case of ICR, you probably want to apply an FFT, either via an external data analysis program or your own user library loaded into or invoked from SIMION. See also SIMION Example: plot (or SIMION Example: excel or SIMION Example: gnuplot) for plotting capabilities. Space-charge: Space Charge can broaden peak shape, lead to saturation effects, and cause coupling effects between peaks. You may or may not want to account for space-charge effects. Other spectrum types: Spectrums for quantities other than mass may also be done. For example, SIMION Example: hda creates an energy spectrum and SIMION Example: faims plots a mobility spectrum, but the method is similar to SIMION Example: spectrum. Peaks that partially overlap might not be distinguishable. For a given instrument, the smallest difference in m/z between two peaks still distinguishable is referred to as . There are different ways to define , such as by full width at half maximum (FWHM) or a % valley. Depending on the instrument, might be constant or it might vary as a function of . The same is true of the quotient . The values and have been termed resolution and resolving power, sometimes interchangeably in a confusing way. For details, see the links below. Standard deviation provides a simple and robust measure of spread. Another statistics often used is full-width-at-half-maximum (FWHM), which measures the distance between positions on the peak where intensity is 50% of the maximum value for intensity in the peak. -- Get index where intensity is a maximum. SIMION Example: spectrum - main example of generating spectrum in SIMION. VirtualDevice Data Analysis has a spectrum plotting and analysis function based on SIMION Data Recording output. RaoPrabhudesai2011. Rao, K. C.; Prabhudesai, V. S.; Kumar, S. V. K. A time of flight mass spectrometer with field free interaction region for low energy charged particle-molecule collision studies. Review of Scientific Instruments. volume 82, issue 11, year 2011, pages 113101. doi:10.1063/1.3653393 – compares SIMION simulated and experimental spectra of TOF-MS.
PrasadTang2009. Prasad, Satendra; Tang, Keqi; Manura, David; Papanastasiou, Dimitris; Smith, Richard D. Simulation of Ion Motion in FAIMS through Combined Use of SIMION and Modified SDS. Analytical Chemistry. : volume 81, issue 21, year 2009, pages 8749-8757. doi:10.1021/ac900880v - simulated and experimental spectra in FAIMS (with mobility/diffusion SDS effects), also referenced in SIMION Example: faims.